Finally, we can start talking about WeddingEngine in public. It’s been a fun secret since last winter. I still remember that day, when all were about to leave the office, a friend called me and announced he was gonna get married in May. Because I work for a WordPress company, he asked if we had any theme that he can build customized wedding website for his girl. Well, that’s a plus for marrying an IT engineer. I agreed and brought it up to the team. Surely they all got excited with the romantic idea. To be honest, it was a nice addition in the middle of all advanced hardware and software projects. Subscribe to WE mailing list and get notified once WeddingEngine launches. Finally, we can start talking about WeddingEngine in public. It’s been a fun secret since last winter. I still remember that day, when all were about to leave the office, a friend called me and announced he was gonna get married in May. 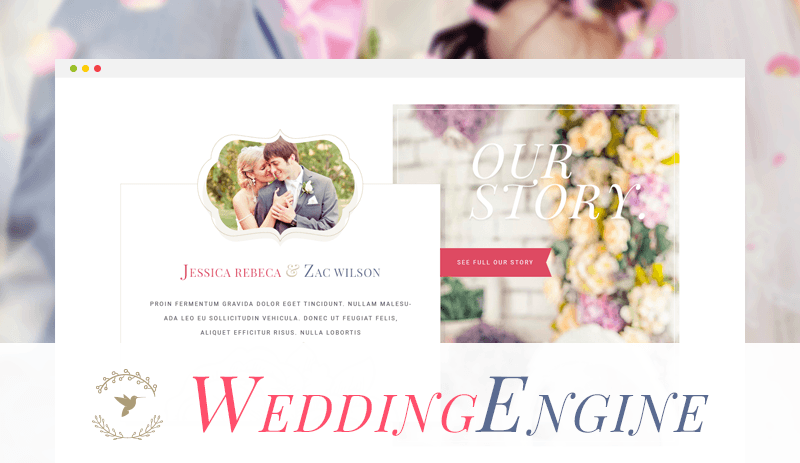 Because I work for a WordPress company, he asked if we had any theme that he can build customized wedding website for his girl. Well, that’s a plus for marrying an IT engineer. I agreed and brought it up to the team. Surely they all got excited with the romantic idea. To be honest, it was a nice addition in the middle of all advanced hardware and software projects. We sincerely dedicate WeddingEngine to our lovely couple who motivated us, and all other happy couples out there. You have come a long way to this holy decision. Preparation takes time, let us help, at least with a beautiful wedding landing page :-) Elena Subscribe to WE mailing list and get notified once WeddingEngine launches.